Welcome to my kampong! You are here because you are probably interested in learning more about Singapore cuisine history and its food… and that’s wonderful! 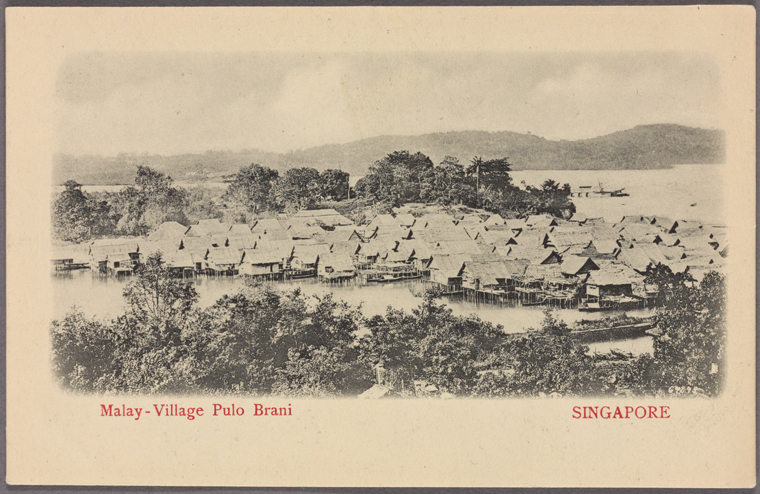 Back when Singapore was a swampy backwater in the 19th century, its early settlers lived in rustic villages known as kampongs. These settlements ranged from small shantytowns with dirt roads to self-containing hamlets with small stores, schools and mosques. And it was in these kampongs where Singapore cuisine history first began. Life in the kampong was simple and idyllic. The pace of life was slower and less stressful, and it was difficult to walk around without nodding at a familiar face. Large extended families lived together under one roof and everyone, including children, helped with household duties like laundry and feeding the chickens. With more space to maneuver about in the kampong, most kampong folks also raised chickens and pigs, and tended to vegetable beds and fruit trees. Depending on the racial makeup of the kampong, the settlement could have different amenities and architecture. Life in the kampong might have been idyllic, but it wasn’t without its difficulties. Flooding was a common occurrence for many rural kampongs. In case you were wondering what a standpipe was, it’s basically a faucet located in a public area like a town square that’s open to the public. It provided running water to residents living in the area. Public standpipes were the first form of running water available in the kampong and villagers had to queue up to fill their buckets. It was a painstaking process to haul water home so many villagers simply bathed, and washed their clothes and dishes by the standpipes. If you cannot imagine living without air conditioning in tropical Singapore, just imagine how uncomfortable it must have been for the villagers on a hot sticky night in the kampong. Most people in the kampong slept under mosquito netting for protection from the pesky bugs and with no fans to relieve the heat, they simply laid as still as possible to stay cool. If you talk to a former kampong dweller nowadays, chances are they will mention something called the “kampong spirit.” Everyone has a different interpretation of what the kampong spirit is exactly but broadly speaking, the kampong spirit is about cooperation and sharing with people in your kampong. Kampong folks were known for their kindness towards one another, as well as towards outsiders. One famous example of kampong spirit took place during WWII, when Singapore was occupied by the Japanese. British and Australian residents, as well as other foreigners living in Singapore were rounded up by the Japanese forces and were taken to POW camps. During the long hot march to the POW camp, the marchers passed through a few rural kampongs and eye-witnesses recalled that several brave kampong folks rushed out of their homes to hand the POWs water and coconut water. Such selfless acts may be surprising to us but to a kampong dweller, it was just part and parcel of kampong life. It was simply the way things were done in the kampong. A couple of eggs for one’s neighbor yielded a gift of juicy mangoes next week; fixing a broken bicycle for a neighbour meant an extra hand when it’s time to repair the leaking roof. On and on, these little acts of kindness reinforced what it meant to live in a kampong, and fostered a cosy sense of belonging in every kampong resident. Even luxuries were shared freely – it was common for neighbours to listen to the radio or watch TV together, as radio and television sets (black and white only) were affordable only to a lucky few. If you grew up in a kampong, then you may recall sitting in a neighbour’s living room or coffee shop listening to a radio program broadcast by Reddifusion (Singapore’s first commercial radio station). So there you have it, a tour of the rustic kampongs of Singapore where the now world-famous Singapore cuisine was born! Peek into the kampong kitchen in our next post! If you’re interested in hearing more about this in the future from me, add your name and I’ll reach out when I have something to say about it. You’ll also get a FREE PDF of 3 authentic Singaporean recipes when you add your name.